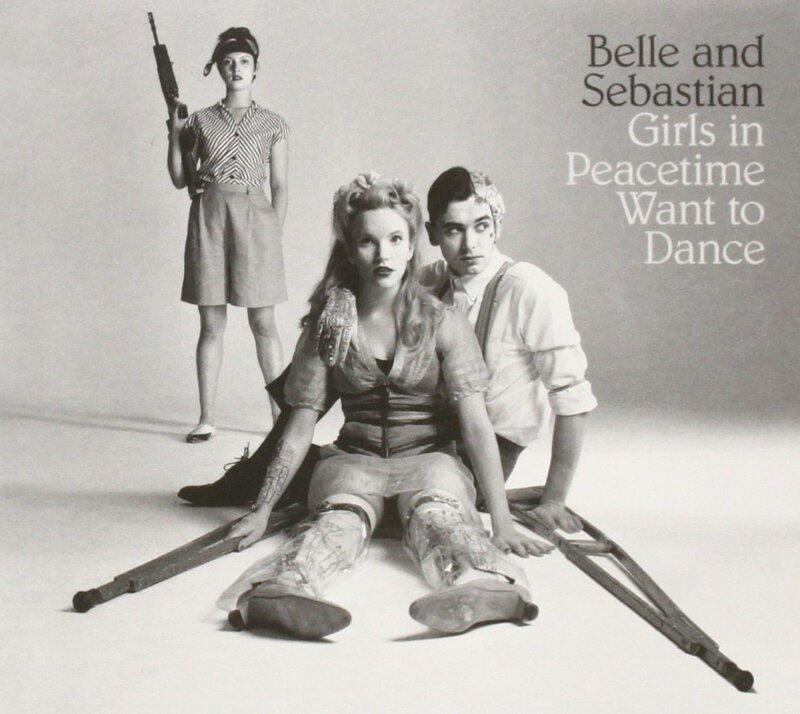 BELLE AND SEBASTIAN-GIRLS IN PEACETIME WANT TO DANCE. Over four years have passed since Belle and Sebastian released their eighth studio album, Belle and Sebastian Write About Love. Since then, Belle and Sebastian’s only release was The Third Eye Centre, a nineteen track retrospective released in August 2013. It featured rarities, remixes, B-Sides, non-album tracks and tracks from E.P.s. Eighteen months after the release of The Third Eye Centre, Belle and Sebastian return with their long awaited ninth album, Girls In Peacetime Want To Dance, which marks a series of firsts. Girls In Peacetime Want To Dance, which was released on 19th January 2015, is the first Belle and Sebastian album to be released worldwide on Matador Records. It’s also the first Belle and Sebastian album to be produced by Ben H. Allen III. The third and final first, is that Girls In Peacetime Want To Dance is the first Belle and Sebastian album to be recorded in Atlanta, Georgia. Belle and Sebastian it seems, are refusing to stand still on Girls In Peacetime Want To Dance, as their twentieth anniversary draws nearer. Still, Belle and Sebastian are still releasing ambitious, and groundbreaking music. That’s been the case throughout their career, and why it would be fitting if Belle and Sebastian were to win the 2015 Scottish Album of The Year Award with Girls In Peacetime Want To Dance. It’s eligible for the 2015 Scottish Album of The Year Award, and is definitely one of the contenders. No wonder. For nearly twenty years Belle and Sebastian have been innovating. It was back in 1996, at Stow College, in Glasgow that Belle and Sebastian were formed. The band was formed by two students, Stuart Murdoch and Stuart David, and was named after Cecile Aubry’s 1965 book Belle et Sebastien. Since then, many members have joined and left the group, one of the most influential being, Isobel Campbell, who joined in 1996 and left the group in 2002, singing vocals and playing cello. Other members include Chris Geddes and Sarah Martin. Whilst at college, in 1996, Belle and Sebastian recorded some demo tracks with the college’s music professor Alan Rankin. Yes. That Alan Rankin, formerly the keyboardist and guitarist in The Associates alongside the late Billy Mackenzie. The demos came to the notice of the college’s business studies department, who each year, released a single on the college’s record label. Belle and Sebastian, by then, had recorded a number of songs, enough to fill an album. Having been so impressed by Belle and Sebastian’s music, that year, the label decided to release an album, called Tigermilk. Tiigermilk, which was produced by Alan Rankin. It was recorded in just three days. Just one-thousand copies vinyl were pressed. Tigermilk was well received and the album sold out quickly. The original copies of Tigermilk are prized possessions of Belle and Sebastian fans. Following the success of Tigermilk, Belle and Sebastian decided to make a career out of music. Stuart Murdoch and Stuart David decided that Belle and Sebastian would become a full-time band. Soon, further members joined the band. Isobel Campbell joined on vocals and cello, Stevie Jackson on guitar and vocals, Richard Coburn on drums and Chris Geddes on keyboards. After Tigermilk’s success, the group signed to Jeepster Records in August 1996, they released their sophomore album If You’re Feeling Sinister. Produced by Tony Doogan, it was released in November 1996. Many people believe that this is their finest album. American magazine Spin, liked the album so much, that they put it at number seventy-six in their top one-hundred albums released in the twenty year period between 1985-2005. Rolling Stone magazine put the album in its list of essential albums of the 1990s. After the release of If You’re Feeling Sinister, the group released series of E.P.s during 1997. The E.P.s were Dog On Wheels, Lazy Line Painter Jane and 3, 6, 9 Seconds of Light. Dog On Wheels featured four songs that were recorded before the formation of Belle and Sebastian. It reached number fifty-nine in the UK charts. Lazy Line Painter reached number forty-one in the UK charts, and 3, 6, 9 Seconds of Light became the group’s first top forty single, reaching number thirty-two in the UK charts. That was the start of the rise and rise of Belle and Sebastian. September 1998, saw Belle and Sebastian release their third album The Boy With The Arab Strap. It reached number twelve in the UK charts. Unlike previous Belle and Sebastian albums, Stuart Murdoch doesn’t feature on vocals. Instead, they’re shared amongst Isobel Campbell, Stevie Jackson and Stuart David. The album received mixed views from the music press. Long time supporter of Belle and Sebastian, Rolling Stone and The Village Voice praised The Boy With The Arab Strap, while others weren’t as impressed. However, since its release, many people, myself included, believe The Boy With The Arab Strap to be Belle and Sebastian’s finest hour. Despite the success of The Boy With The Arab Strap, Belle and Sebastian changed direction musically. Two years after the release of The Boy With The Arab Strap, Belle and Sebastian released Fold Your Hands Child, You Walk Like A Present. Released in June 2000, the album was produced by Tony Doogan. It’s best described as chamber pop. Fold Your Hands Child, You Walk Like A Present has a much more laid-back, mellow sound. The tempo is slower, while vocals are shared amongst band members. Then there’s the strings. They’re used more extensively. Sadly, this was the last album to feature founder member Stuart David. For their next album, Belle and Sebastian would try their hand at writing a film score. Much of the summer of 2003 saw Belle and Sebastian recording their sixth album. Losing Isobel Campbell wasn’t the only change in the life and times of Belle and Sebastian. No.They’d left Jeepster and signed to Rough Trade. Tony Doogan was replaced as producer. His replacement was Trevor Horn. His credentials seemed somewhat questionable. Previously, ex-Buggle Trevor Horn had he’d been an award winning producer and songwriter. Recently, he’d been working with Charlotte Church and Lee Ann Rimes. Considering Belle and Sebastian were one of the hottest indie bands, they seemed strange and awkward bedfellows. It seemed Trevor Horn had been brought in to polish of the band’s rough edges. Rough Trade, a supposed indie label, were polishing away part of the group’s charms. Many onlookers were horrified, afraid of the direction Trevor Horn would take Belle and Sebastian. In some ways, these fears were justified. Gone was the folksie, melancholy, chamber pop of their roots. Dear Catastrophe Waitress was the polar opposite of previous albums. Replacing it, was the slick, poppy charms of the Trevor Horn produced Dear Catastrophe Waitress. On its released in October 2003, it was nominated for an Ivor Novello award. Critics gave Dear Catastrophe Waitress favorable reviews. On both sides of the Atlantic, Dear Catastrophe Waitress appealed to critics. Despite the positive reviews Dear Catastrophe Waitress received, thankfully, Belle and Sebastian and Trevor Horn never renewed their aquaintance when they released their next album, three years later. Between the release of Dear Catastrophe Waitress and 2006s The Life Pursuit, Belle and Sebastian kept busy. In 2005, they released a twenty-five track compilation entitled Push Barman To Open Old Wounds. Featuring a series of E.P.s Belle and Sebastian had released, critics adored the album. Hailed as vintage Belle and Sebastian, they were crowned the best indie band. Very different from Dear Catastrophe Waitress, Push Barman To Open Old Wounds was the Belle and Sebastian their fans knew and loved. Push Barman To Open Old Wounds wasn’t Belle and Sebastian’s only release during 2005. No. Belle and Sebastian released their first live album, If You’re Feeling Sinister: Live At The Barbican. Released in December 2005, this allowed Belle and Sebastian to revisit their 1996 album If You’re Feeling Sinister and rectify what the band believed to be the mistakes of the original album. That night in September 2005, Belle and Sebastian took the Barbican by storm, playing an encore lasting over an hour. This encore would prove to be somewhat prophetic. When Belle and Sebastian released The Life Pursuit in February 2006, it proved to be their most successful album. The Life Pursuit was produced by Tony Hoffer, who previously, produced Air, Turin and Beck. He was a much better fit than Trevor Horn. On its release, The Life Pursuit reached number eight in the UK and number sixty-five in the US Billboard 200. Funny Little Frog gave Belle and Sebastian the biggest hit single of their ten year career. Despite that, it would be four years until Belle and Sebastian released their next studio album. Following the release of The Life Pursuit, Belle and Sebastian headed out on tour. They were now well versed in the album, tour, album, tour routine. To ensure their fans didn’t forget them, Belle and Sebastian released The BBC Sessions in November 2008. A double-album, the first disc featured many songs that featured Isobel Campbell. These songs had never been heard before. So for fans of Belle and Sebastian this was a real must have. As for the second disc, it features Belle and Sebastian live in Belfast, which sees the group cover Thin Lizzy’s The Boys Are Back In Town. While The BBC Sessions kept Belle and Sebastian’s fans occupied, the group recorded their most successful album to date. October 2010, saw Belle and Sebastian released their eighth studio album. Entitled Belle and Sebastian Write About Love, it was the second Belle and Sebastian album produced by Tony Hoffer. Recorded in Los Angeles, rather than Glasgow this surprised some people. Tony’s decision to take Belle and Sebastian out their comfort zone worked. He was proving to be the perfect foil for Belle and Sebastian’s foibles. Featuring contributions from Norah Jones, Sarah Martin and Carey Mulligan, Belle and Sebastian and friends struck musical gold. Reaching number eight in the UK, Belle and Sebastian Write About Love reached number fifteen in the US Billboard 200. Critically acclaimed and a hot worldwide, this was a long way from recording Tigermilk in three days as part of a college project. Belle and Sebastian were indie Queens and Kings. Despite this, the continued to things their way. While many bands would’ve headed straight back into the studio and had a followup to Belle and Sebastian Write About Love release A.S.A.P, this isn’t the Belle and Sebastian way. No. Not only do Belle and Sebastian do things their way, but they care about their fans. So, whilst taking their time recording a followup to Belle and Sebastian Write About Love, they’ve released a nineteen track retrospective, The Third Eye Centre. This nineteen track retrospective, The Third Eye Centre, features rarities, remixes, B-SIdes, non-album tracks and tracks from E.P.s. The music spans Belle and Sebastian’s career. There’s tracks from albums produced by Tony Doogan, Trevor Horn and Tony Hoffer. Bonus tracks sit side by side with remixes, while B-Sides and charity singles. In some ways, The Third Eye Centre allows the listener to hear another side to Belle and Sebastian. The Third Eye Centre was the perfect amuse bouche until Belle and Sebastian released their ninth studio album. Work began on Belle and Sebastian’s ninth album back in 2014. By then, the members of Belle and Sebastian had written twelve tracks. These tracks would become Girls In Peacetime Want To Dance, which somewhat surprisingly, was produced by Ben H. Allen III. This was a strange, and somewhat controversial decision. Many people thought Tony Hoffer, who produced Belle and Sebastian’s previous album, Belle and Sebastian Write About Love would return.Belle and Sebastian Write About Love was the second Belle and Sebastian album produced by Tony Hoffer. The first was The Life Pursuit. Tony seemed to bring out the best Belle and Sebastian. However, this being Belle and Sebastian, it’s always a case of expect the unexpected. After all, previously, Belle and Sebastian hired Trevor Horn, who gave their music a slick, polished sheen. So maybe, bring in Ben H. Allen III to produce Girls In Peacetime Want To Dance would work? Some sceptics had their doubts. After all, Ben H. Allen III’s C.V. showed that previously, he had produced Animal Collective and Washed Out. This was very different to Belle and Sebastian. However, maybe, Belle and Sebastian and Ben H. Allen III would prove a potent partnership. For their ninth studio album, Girls In Peacetime Want To Dance, Belle and Sebastian penned twelve tracks. Much of the recording took place in Atlanta, Georgia. That’s where Belle and Sebastian recorded nine tracks. They were produced by Ben H. Allen III, who mixed seven of the tracks with Jason Kingsland. Additional recording took place at other studios. This included adding strings at Human Win studios, in Minneapolis, Minnesota and recording three tracks in the familiar surroundings of Glasgow’s Castle Of Doom Studios. The other three tracks on Girls In Peacetime Want To Dance, The Everlasting Muse, Born To Act and Perfect Couples were recorded at Castle Of Doom Studios, in Glasgow. These three tracks, plus A Politician’s Silence and Nobody’s Empire were mixed by veteran Scottish producer, Tony Doogan, who previously, has produced four Belle and Sebastian albums. Once Girls In Peacetime Want To Dance was completed, it was released on 19th January 2015. Prior to the release of Girls In Peacetime Want To Dance, The Party Line was chosen as the lead single on 29th October 2014. It was a taste of what to expect from the Ben H. Allen III produced Belle and Sebastian. Then on 19th January 2015, Girls In Peacetime Want To Dance was released. Mostly, the reviews were favourable. Critics noted that Belle and Sebastian were still, among the most talented modern day songwriters. However, their music had been given a makeover. Girls In Peacetime Want To Dance is akin to a call to dance. Thanks to Ben H. Allen III, much of Girls In Peacetime Want To Dance has a faux disco beat. This is Belle and Sebastian as you’ve never heard them. It’s not just Girls In Peacetime Want To Dance, but Belle and Sebastian too. Just like Belle and Sebastian have always done, several times before, they’ve reinvented themselves on Girls In Peacetime Want To Dance. Opening Girls In Peacetime Want To Dance is Nobody’s Empire, one of the four songs mixed by Tony Googan. His mix is perfectly balanced, Chiming guitars are panned left, a bass probes its way through the mix and the incessant 4/4 beat sets the scene for Stuart’s wistful vocal. As Stuart delivers cerebral, thoughtful lyrics he’s accompanied by a piano, washes of synths and later, cooing, ethereal harmonies and percussion. Later, horns sound, as other members of Belle and Sebastian add backing vocals. They add to what’s an anthemic, dance-floor friendly track full of social comment and hooks aplenty. A scatted vocal pensive piano and firmly strummed guitar opens Allie. Soon, the rocky arrangement bursts into life. Stuart’s vocal is mixture of frustration, anger and pity, at “Allie…you want to hurt yourself.” He sees Allie as selfish, and either unable, or unwilling to see the bigger picture. This includes war, crime and cutbacks. Throughout the song, Stuart’ frustration, is omnipresent, as he delivers a heartfelt plea. As he does this, urgently, the rhythm section and guitars drive the arrangement along. This is the perfect foil for Stuart, as Belle and Sebastian return to what’s nearer their traditional, trademark sound, while reminding the listener that they’re songsmiths par excellent. The introduction to The Party Line is bathed in filters. below the filters is a pulsating, dance-floor friendly arrangement. It comes courtesy of synths, drums and percussion. Stuart’s vocal is a sultry vamp. It’s augmented, and complimented, by backing vocalists. They add to what’s a polished slice of dance-floor friendly electro pop. This is Belle and Sebastian like you’ve never heard them before. For some people, this will come as a shock. The only similarity is Belle and Sebastian’s insightful observations on life. They’re omnipresent throughout Girls In Peacetime Want To Dance. As drums pound, an orchestral arrangement quivers on The Cat With The Cream. Soon, Stuart’s despairing vocal sets the scene. You’re soon empathising with Cathy’s loneliness and fear. Later, her imagination runs riot. Scenes unfold before her eyes. The “freak parade” unfolds. Before her eyes, a parade of corrupt politicians and a country’s grubby history unfolds. Then she’s praying, “praying for the light.” Having done so, she waits for a “sign…her instructions.” Cathy hopes that she’s “destined for greatness, I want to be Queen.” Longingly, she wills herself back to a time and place when “in days of old when knights were bold, it was settled by the King.” Sadly, that’ll never happen, and still, Cathy sits lonely and fearful. Poignant, and tinged with sadness and beauty, Belle and Sebastian are still master craftsmen when it comes to songwriting. Enter Sylvia Plath has in its roots of eighties Euro Disco. Against this pulsating dance beat, one thing stays the same. That’s Stuart’s vocal. It’s tinged with emotion as he delivers lyrics that are typically cerebral and cinematic. Again, he paints pictures. Meanwhile, Sarah’s sultry female vocal flits in and out, as the arrangement grows in power and tempo. It powers along, with Belle and Sebastian seemingly enjoying the journey. The Everlasting Muse has a much more understated, atypical Belle and Sebastian sound. That’s partly, down to Tony Doogan, who mixed the track. His mix doesn’t seem as loud as the tracks mixed by Ben H. Allen III. This suits the track. Just a standup bass and drums set the scene for Stuart’s hopeful vocal. Soon, a Fender Rhodes panned left shimmers, while clunky percussive sound is panned right. That’s the sign for the tempo to quicken and Stuart’s vocal to veer between hopeful, needy and occasionally, joyful. Soft, ethereal harmonies and a soaring trumpet add the finishing touch to what’s a captivating, hopeful paean. Tony Doogan also mixed Perfect Couples, which again, seems to have more space than the tracks mixed by Ben H. Allen III. Afrobeat seems to have influenced introduction the introduction. Perucssion plays, before washes synths bubble and whoosh. They’re joined by rocky guitars pounding drums and Stevie Jackson’s vocal. He seems to relish his starring role in this dance track. His chameleon like vocal veers between deliberate, to dramatic and even, briefly, a croon, as tongue firmly in cheek, he mocks his “Perfect Couples.” By then, his vocal is bather in filters and accompanied by harmonies. Add in scorching, searing guitars and advice and the result is one of the highlights of Girls In Peacetime Want To Dance. Play For Today sees the musical adventure that’s Girls In Peacetime Want To Dance continue. There’s yet another change in direction, as Play For Today has its roots in Euro Pop and Euro Disco. Against a pulsating backdrop of drums and washes synths the arrangement bounds along. Atop the arrangement sits the vocal. They come courtesy of Stuart and Dee Dee Penny. Their vocals sit well together. Mind you, so would Stuart and Sarah Martin. Having said that, Stuart and Dee Dee combine angst, drama and emotion on this seven minute epic. Sarah Martin makes a welcome return on The Book Of You. Her tender vocal sits above an arrangement that’s variously clunky, industrial, dark and dance-floor friendly. As the arrangement buzzes, guitars, drums, harmonies and sci-fi synths accompany Sarah. The coup de tat is a blistering guitar solo. It’s panned at thirty degrees right and although slightly muted, takes the track the next level. Closing Girls In Peacetime Want To Dance is Today (This Army’s For Peace). It’s a thoughtful, wistful track with an understated arrangement. The rhythm section, chiming guitars and occasional swathes of lush strings join Stuart on what’s a beautiful, hopeful way to close Girls In Peacetime Want To Dance, Belle and Sebastian’s ninth album. Girls In Peacetime Want To Dance is unlike any of Belle and Sebastian’s previous eight albums. Producer Ben H. Allen III took Belle and Sebastian way out of their comfort zone. On several tracks, Ben H. Allen III added a pulsating faux disco beat. The nearest to Girls In Peacetime Want To Dance Belle and Sebastian have come, is the Trevor Horn produced Dear Catastrophe Waitress. With its slick, polished, poppy sheen, Dear Catastrophe Waitress was the polar opposite of what we’ve come to expect from Belle and Sebastian. Belle and Sebastian have their own unique sound. It took shape on the quartet of albums produced by Tony Doogan. From 1996s If You’re Feeling Sinister, through 1998s The Boy With The Arab Strap, Fold Your Hands Child, 2000s You Walk Like a Peasant and 2002s Storytelling, Belle and Sebastian’s trademark sound gradually take shape. Then came the Trevor Horn Dear Catastrophe Waitress. That was a one-off. Tony Hoffer then produced 2006s Belle and Sebastian Write About Love and 2010s The Life Pursuit. However, Tony Hoffer didn’t return for Girls In Peacetime Want To Dance. Instead, Ben H. Allen III took his place on what’s a quite different album from Belle and Sebastian. Before the release of Girls In Peacetime Want To Dance, it was hard to imagine Belle and Sebastian ever making a dance album. However, with Belle and Sebastian, never rule anything out. They’re a contrarian band, always determined to do things their way. This includes making a dance album. On Belle and Sebastian’s “dance album,” Girls In Peacetime Want To Dance, there are some tracks with a pulsating 4/4 dance beat. Other tracks are less “in your face.” They’ve a more indie dance sound. By that, I mean that they’re more tracks that you can dance to. Some tracks, however, feature the more traditional Belle and Sebastian sound. They’re a reminder of who Belle and Sebastian really are. One thing remains the same throughout Girls In Peacetime Want To Dance, the lyrics. As usual, Girls In Peacetime Want To Dance showcases the literary talents of Belle and Sebastian. They’re wordsmiths extraordinaire. Each song features lyrics that are cerebral, eloquent, emotive, joyous, melancholy and poignant. Beauty is feature of many of the lyrics. However, others are full of pathos and sadness, and relentlessly tug at your heartstrings. Especially when delivered by Stuart Murdoch, Sarah Martin and Stevie Jackson. Even when accompanied by Ben H. Allen III’s pulsating faux disco beat. With Ben H. Allen III’s help, Belle and Sebastian, not for the first time, reinvented themselves again. Some would have as believe that Girls In Peacetime Want To Dance it seems, is the musical equivalent of a midlife crisis. That’s far from the truth. Girls In Peacetime Want To Dance was an ambitious album where Belle and Sebastian were taken out of their comfort zone. However, they’ve made their dance album, it’s now time to move on. By that, I mean change direction again. Belle and Sebastian find themselves in a similar situation after Dear Catastrophe Waitress. Belle and Sebastian couldn’t release Dear Catastrophe Waitress II. They had to move on. This is the case once again. For their tenth album, Belle and Sebastian shouldn’t release Girls In Peacetime Want To Dance II. No. It’s time to return to what many people regard as the classic Belle and Sebastian sound, where elements of chamber pop, folk, lo-fi and indie pop combine. That’s what Belle and Sebastian’s fans want. Especially for their tenth album, and twentieth anniversary. Next year, 2016, Belle and Sebastian celebrate their twentieth anniversary. Hopefully, this celebration will involve the release of their tenth album. An added bonus would be the return of Tony Doogan as producer. Tony played an important part in the rise and rise of Belle and Sebastian, producing four albums between 1996 and 2002. Next year, will make fourteen years since the chameleon-like Belle and Sebastian and Tony Doogan last worked together. Both parties are older and wiser, so it would be a tantalising prospect to see what they would come up with? Who knows, it could either be a return to the classic Belle and Sebastian sound, or a dance album like Girls In Peacetime Want To Dance, which is a contender for the 2015 Scottish Album of The Year Award?